1. Click on My Account at the top right of the screen. 2. Under the Account Settings section, click Contact Tags. 3. In the Create a new tag field, type in a new tag name. 5. The window will refresh and your new tag will appear in the Tag List. 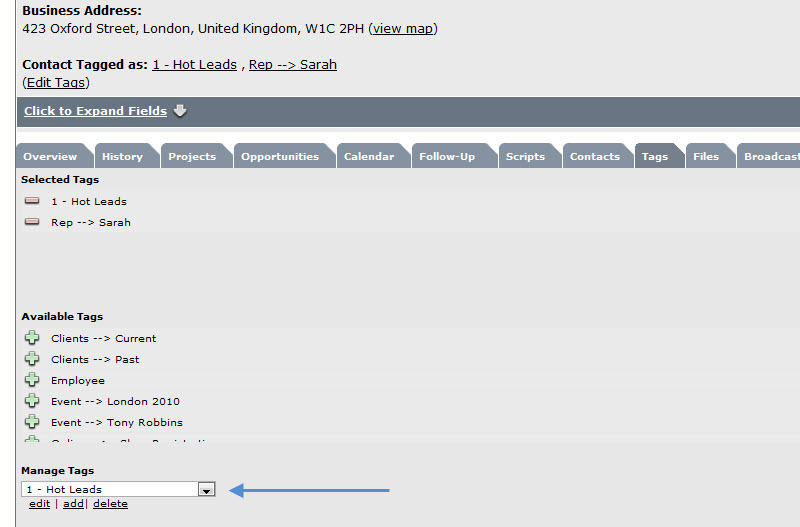 Tip: Click on View List beside a tag name to view all contacts currently associated with the tag. From the new window, you can then click a contact name to open the full contact record in a new window. 2. Using the search options at the top of the Contacts Window, find a contact you would like to tag. 3. Click on the contact name to open the contact record. 4. Click Tags at the bottom tabs of the contact record. 5. From the Available Tags list, select a tag name and then click Add. 6. Your tag will appear above in the list of Selected Tags. Note: As shown above you a can also MANAGE TAGS from the contact record as well.